I am often asked how I get such regular quilting that is so close together, so my next 2 posts will be on the steps I use. I am still working on the Hemlock piece shown in an earlier post. First of all, the batting is wool and polyester blend. It is very easy to work with. On the advice of Ruth McDowell, I use a backing fabric of heavy weight decorator cotton. I pin baste closely with long Japanese pins. Then I hand baste with silk thread that blends and a fine needle in a 2 inch grid. 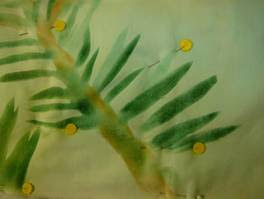 Silk slides through the layers easily and reduces stress on fingers. I learned the importance of fine basting from Cherilyn Martin who does fantastic quilting to create textural patterns on her quilts. Next I select a variety of threads. I love variegated threads that have very little change in values. They are hard to find, but worth looking for. The first selection may very well be added to as I work. Thread becomes my paint for all the details. 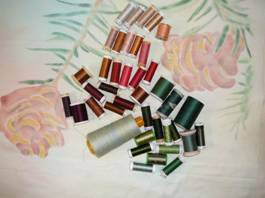 I love the King Tut Tone on Tone, YLI Machine quilting, Mettler silk-finish multi, and some Sulky Blendables. I used a deep green variegated YLI silk thread for the hemlock needles on this piece and loved it. 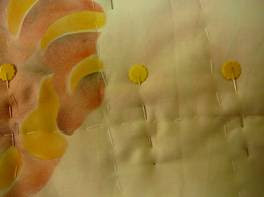 My first machine quilting stitches closely follow the outline of the design. I go for the long lines first. This is all straight stitching with the built- in walking foot on my old 1473 Pfaff. I use an open- toed embroidery foot to see where my needle is going. Next time I will show how I do the close stitching.